TEXT CLUB EXCLUSIVE OFFER – 24 HOURS ONLY! The most popular order for new customers is the 3 bottle package, and that’s what I recommend to start with. However, because we have many repeat customers, we offer the 6 bottle package so you can take advantage of even deeper discounts. Simply mix one scoop of this powder in to a beverage of your choice – water, iced tea, juice – and it’s ready to go. Drink just one glass a day on a consistent basis. The formula digests easily so you can take it with or without a meal, whenever you’d like. As a physician, I know that individual bodies can react differently to the very same compounds. Even though everyone can benefit from the polyphenols and probiotics in this formula, I’m aware that results can vary. So, if you’re unsatisfied with this product for any reason whatsoever after a full 90 days of use, I’ll return your money, hassle-free…guaranteed. I no longer feel bloated and my stomach is almost flat again, my energy level is soaring, and I just plain feel absolutely great! Every adult should allow themselves the opportunity to experience Vital Reds – I promise you won’t regret it! I look forward to starting out my mornings with a glass of Vital Reds. I have noticed that this drink curbs my desire for sweets through out the day, and a definite increase in my energy level. I haven’t felt sluggish for three weeks now. I have even noticed that my short term memory has improved as well as my ability to sleep better at night. 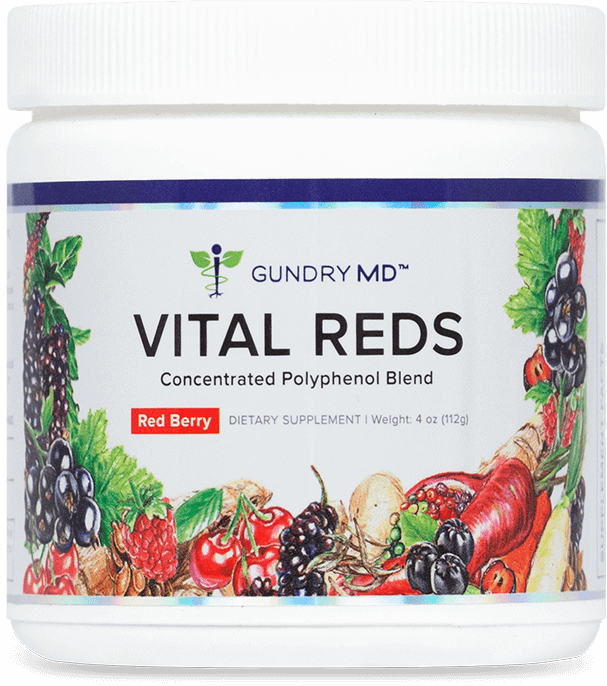 After mixing Vital Reds each morning in an 8 ounce glass of water and drinking it for a week, I noticed improved energy, less brain fog and more regularity. I’ve been taking it now for about 3 weeks and love the way I feel. I took it to my doctor for her to review and she was impressed. I love this product! I actually enjoy taking it, the taste is great, and the amount is so small it mixes easily with water and does not have a heavy texture. It’s easy to add to one of my glasses of plain water daily and get loads of polyphenols!I actually feel better after taking it! I purchased a 3 month supply of Vital Reds which I mix in with my morning protein powder. The taste is not offensive at all, and I honestly feel great just ran out, so I’ll be ordering more soon! Dr. Gundry is a God send! This formula was designed to help reduce the fatigue and energy dysfunction which act as warning signs for much more serious health problems. I’ve combined the power of 25 polyphenol-rich superfruits with dozens of natural fat-burning ingredients to help your body maintain higher energy levels and fast metabolism.